"The committee believes, on the basis of the evidence available to it, that President John F. Kennedy was probably assassinated as a result of a conspiracy. The committee is unable to identify the other gunman or the extent of the conspiracy." From the very beginning, the Powers that Be have treated the Warren Report as if it is the word of God, come down from on high, etched in stone. In the picture above, that big book almost looks like a stone tablet. Why, it might was well be Moses himself placing it in Lyndon Johnson’s awaiting hands. Later, he would tell Walter Cronkite that he never believed in the lone gunman theory. After second thoughts he asked CBS is delete the comment, under the grounds of National Security. A moment of candor we are not supposed to know about. In a 1999 doctoral dissertation by Ross Frank Ralston, he relates an important concept in the study of the JFK. It is the principle of "hegemony" in the media. In other words, the ability of the certain players in the media to dominate others. According to Ralston, those main players are CBS and Time-Life in the way they presented the government’s case in the assassination. And early on, they set the standard as to how the assassination would be relayed to the public after the Warren Report was published in late 1964. The Warren Report, as Ralston summarizes is, "a man in a building shot a man in a car..."
However, there is more than one theory of what happened because there was another, and final, investigation launched in 1977 to become known as the House Select Committee on Assassinations. In this case they explored both the deaths of John F. Kennedy and Martin Luther King. 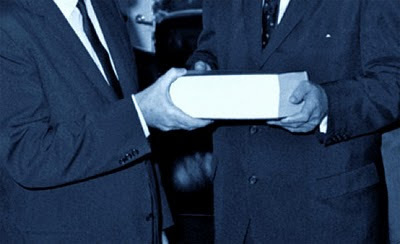 Despite political infighting and government agencies lacking in openness and outright lying to the Committee (i.e., CIA) they final report published in 1979 concluded there was a possibility of a conspiracy in the deaths of Kennedy and King but they didn't have the means to continue any further investigation. So we are left with two official government investigations both with different outcomes. The first, a lone gunman with no confederates; and the last, more than one gunman with a conspiracy in play. 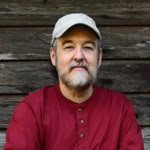 What Ralston concentrates on in his dissertation is how the media focuses on the former, ignoring the latter, and extending into every possible area of the media from print to TV. In effect, the Warren Report becomes the sum of all things. The way the "Fourth Estate" functions with the Kennedy assassination has long been the fly in the ointment. It is a frustrating issue to examine. Where they should question, they accept without comment. Isn't one of the aims of journalism to research what the facts are? Research what you are told? After all, we are not living in Nazi state, right? In many ways the American press operates like a propaganda arm of the government. Joseph Goebbels never had it so good! One can view this behavior in the way they cover the official government investigations from JFK, to Watergate, to 9-11. And therein lies the disconnect. The public will question what the are told; the mainstream press, largely, will not. The Watch Dog became the Lap Dog. No one in the American Press ever did a critical analysis of the Warren Report, the 26 volumes of collected evidence and hearings, from then till now. It is as if they wanted to prove the Government's story of what happened. And why? Probably because press independence is a thing of the past. Plus, there are many connections between the government and press at this point. As Carl Bernstein reported in a piece for Rolling Stone magazine in 1976, he found at least 400 CIA operatives in the press, either as volunteers or paid agents. The internet itself has been a great boon to critical thought on JFK’s assassination. No other media outlet comes close. True, there is a lot of junk out there, misinformation out there from both sides of the issue. One ultimately needs to do their own research to filter out the nonsense. And as I have found in my own research, a careful examination of the evidence paints a totally different picture of the assassination and the surrounding events. Well, back in the day when there only three networks reporting the news it was easy to play cover for the Ruling Class. Or for that matter, cover up anything that status quo wanted. Of course they have their own shills in operation on the Internet now as well, but they are all just voices–their impact is diminished as there are so many more voices in opposition. Ross Frank Ralston does a good job at accounting the various machinations of CBS, Time and Life. It’s the standard mishmash of cherry picked evidence, straw man arguments, and slight of hand, misdirection ploys. These guys are good! And run this same game now. Just watch any History Channel or Discovery Channel documentary on the assassination of Kennedy and you’ll see the Warren Commission’s conclusion verified every time. If you take note of any of these documentaries, they aim is to support the government’s theories and claims on everything from assassinations to terror attacks. While there are too many to document in this post, you can download the PDF HERE (about 7.9 megs in size). I would however, like to point out a few discrepancies that Ralston chronicles regarding the 1967 CBS Kennedy assassination documentary since so much malfeasance occurred masquerading as a legitimate journalistic investigation. Such as, when they tell us that Oswald’s rifle, utilized by an expert could recycle the weapon in 5 seconds. (The Warren Report settled on 4.8 to 5.6 seconds.) Sounds reasonable, of course. The trouble is, they never alert the viewers that Oswald was never an expert rifleman and barely qualified on his last of three marksmen tests. Nor do they mention the three metal shims used to properly align the telescopic site, or a host of other problems with the lone gunman scenario. (And I might add, you can read about this and a lot more here on this blog.) And since then, a FOIA request has uncovered a CIA document that their own photographic analysis department concluded a time span of just 1.6 seconds, obviously far too fast for anybody to work the bolt manually. Never the less, it’s interesting to see how they manipulate the facts so the man in the building is forever shooting at the man in the car. The Lone Gunman is an ever present character in documentaries like this since he’s the fall-guy to quash conspiracy. In CBS ballistics tests done with a Mannlicher-Carcano, which by the way, is a model they acquired, not Oswald’s original weapon, they used it to shoot up masonite and gelatin dummies to simulate bone and flesh. Their conclusion? Yep, one bullet could do all that damage on two men. The trouble is, they never showed what the spent bullets looked like. Did they resemble CE399, the so-called pristine bullet? We’ll never know for sure but my hunch is that it did not. It certainly didn’t at the Edgewood Arsenal test where experts fired at the radial bones in 10 different cadavers and all ten bullets were, as Dr. Joseph Dolce said in his report, “markedly deformed.” He was never called to testify for the Commission and his report was concealed. One thing Ralston left out, which I think is particularly egregious of CBS, is the way they treated Orville Nix in this show. He, of the Nix film and a witness to shots coming from the grassy knoll was interviewed in such a way so they could edit the tape later so he was heard saying the shots came from the school book depository building. This bit of tomfoolery is what they Nazis used to make propaganda films showing Jews in the ghetto, living happily. Years later, another TV producer would pull the same stunt on Jim Garrison making him look like a nut saying there were 33 gunmen in Dealey Plaza. When actually, he was referring to the number of people involved in a conspiracy. Garrison thought only six gunman were involved in the slaying, which were cut out of the final broadcast in order to make him look like a fool. This is an example of the nasty games these people play under the guise of “journalism.” Yes, journalism for their Masters. And this is why the Internet so great. They can’t do this now. It would be posted somewhere on the web. One can see why the Ruling Class despises this new medium so much and are constantly floating ways of controlling it. As we used to say, “The free press is free for whomever owns one.” Now we all do. Look at the lengths the government goes to quash a conspiracy in the death of John F. Kennedy? If this case is so strong and so true, why go to all the trouble to manipulate witness testimony as the CBS did with Orville Nix, or Life Magazine’s notorious shuffling of the Zapruder film frames in order to fool the public in thinking all the shots came from the rear? What do they have to fear? Why do they want us to believe this myth they created, so strongly? Probably because there is official history and there is what actually happened. They fear the truth and the public’s lack of confidence in them and their seat of power. Finally, they failed. The Majority do not believe the official fiction of what happened. They fail every time they have to resort to Nazi-style propaganda techniques in order to present their case, and by doing so, show us how weak their case really is. Photographer and writer by trade with a broad range of interests that include just about everything with a primary interest in JFK and current events. Marguerite Oswald said before the Warren Commission that her son, Lee Harvey Oswald, was in her words, “a government agent.” And there lies the crux of it all. Who was this man? Why is he so important that even at this day, over forty years later, information on him remains classified? There are still secrets to be uncovered deep in the bowels of the beast. All articles on this site are © 2008-2017 by George Bailey. 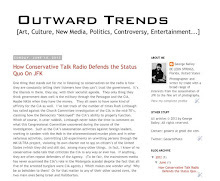 Just posted, Outward Trends features a variety of reporting on current issues. Need stock photos? Check mine out at Shutterstock.com. Available at Blurb and free on iTunes.